::: DJ ALFONSO'S MUSIC CABINET :::: RENDEZVOUS! at Verdugo Bar on Friday, April 30th! Join us this Friday, April 30th, for a special edition of RENDEZVOUS! 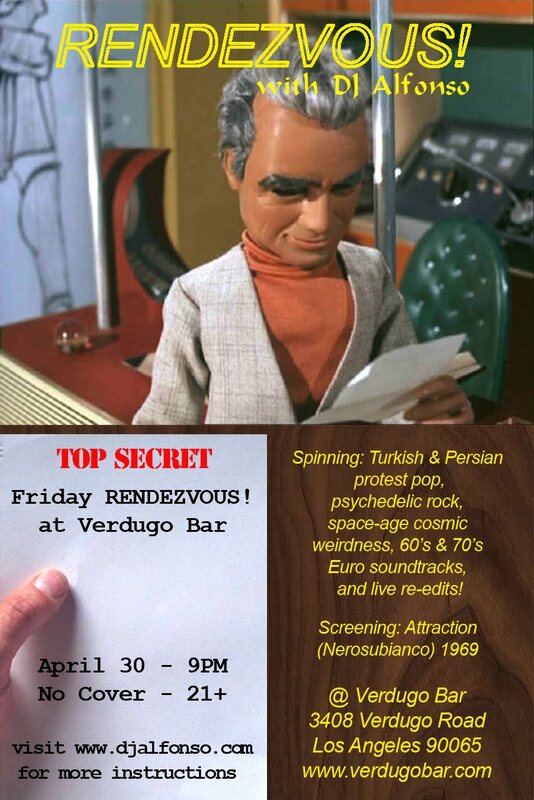 We will be spinning all your favorite Turkish & Persian protest pop, psychedelic rock, space-age cosmic weirdness, 60's & 70's Euro soundtracks, and live re-edits on the SP-303! We will also be screening one of the great taboo-smashers of the late '60s - Attraction (Nerosubianco) directed by Tinto Brass.